5793 labyrinths found. Showing 1521-1540. Sorted by country, state, city, then zip/postal code. 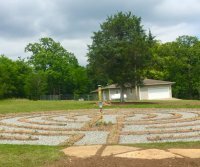 Labyrinth is on property belonging to the Ozark Theosophical Camp, which is normally not accessible to the public except on specific weekends when the camp is in session. Stones mark the lines. Sometimes the paths might be overgrown, depending on how recently the grass was mown. Located one block south of the church, on the corner of Pecan and East 5th. A memorial orchard has been planted around the labyrinth which was constructed as a Eagle Scout project by one of the youth of the church. Exit I-40 at Route 59; turn south on Route 59; at second light turn left on Pointer Trail; at 9th Street turn right. Continue on 9th Street until the Outdoor Trinity and Trinity Episcopal Church are visible on the left. Turn left into the parking lot. 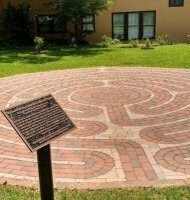 The Outdoor Trinity consists of a Chartres replica labyrinth, the Stations of the Cross, and an outdoor altar. Labyrinth open any time the Inn is open. 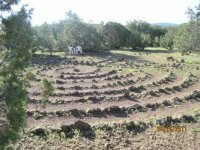 Two Classical 3 circuit or Cretan design labyrinths (one female energy, one male energy) and one 3 circuit Roman design Labyrinth. Directions to Church: From Phoenix, go north on I-17 to Exit 227 - Daisy Mountain Drive. Turn Right on to Daisy Mountain Drive. Continue about 1.5 miles on Daisy Mountain and then turn right on to Meridian Drive. Almost immediately on the right will be Rose Canyon Circle and St. Rose Parish. There is a small office building on the north side of the property. 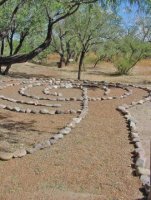 Nestled in to the natural landscape of the back area behind the office property is the pathway to the labyrinth, it is just off a small prayer grotto. Available to travel to your site. Used for retreats and special events. 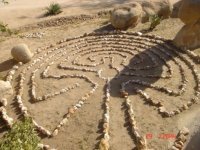 This is a community labyrinth and all are welcome to walk. Park on Geronimo Road or pull into Anderson Lane, take an immediate right to park by the gravel pile. Off Rt 60, near Parralta Trail. just behind the Ren Fair site. 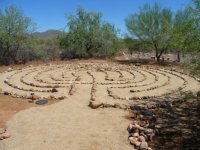 This Labyrinth is located at the Superstition Mountain Museum and is named The Lost Dutchman Labyrinth - since Feb 11, 2011, over a 1,000 people have walked it. 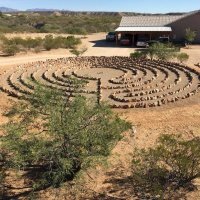 Labyrinth is located on open space next to the community garden. Pomerene Exit from I-10, toward Pomerene. From Pomerene Rd., right into the San Pedro Ranch. 2 miles to Two Hills Back, turn left. 3rd house on left. 2nd driveway. Park, walk, leave prayer requests or comments. Please call/text or email to let us know you are coming. Please call/text or email to let us know you are coming. Generally open sunrise to sunset. Seven path Classical, constructed of quartz rock found nearby. Call or email for for directions: we are 16 miles east of Show Low and a first-time visitor will need help finding us. Labyrinth is in the rear of building. Park in the front and walk around to the back.